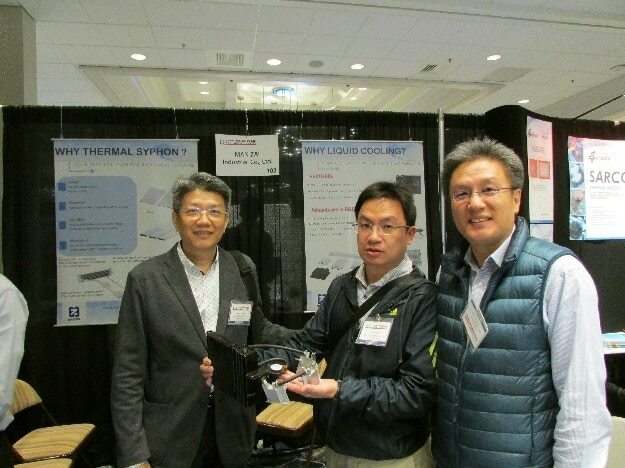 SEMI-THERM 33 concluded last week at Silicon Valley, CA and Electronics Cooling was the only media and content provider present on the exhibit floor. We take this opportunity to thank our readers and contributors who stopped by our booth to learn about our plans for this year including 2017 Thermal Live! We are so pleased to know that many of you like our content, our new webpage, and our emphasis on covering thermal management across multiple disciplines. Continued improvements in Thermal Interface Materials (TIM) –in thermal conductivity, thinner gap-filling and conforming materials. Test equipment for characterization of TIMs. Excellent advances in higher thermal conductivity materials for enclosures, carriers, substrates and heatsinks –Aluminum with Graphite, Chemical Vapor Deposited (CVD) Diamond, Carbon composites, etc. More improvements in user-friendly and better EDA-integrated thermal simulation tools. Continued advances in heatsinks – in form factor, materials, fabrication methods and integrated cooling fans. Advances in liquid cooling including thermal siphon, better quality and lightweight couplings, no-leak quick disconnects, etc. For those of you who did not make it to SEMI-THERM this year, we requested all exhibitors to provide an update on their latest technology and product offerings showcased at SEMI-THERM. In the following paragraphs, you will find brief descriptions of the latest products from thermal management solution providers. 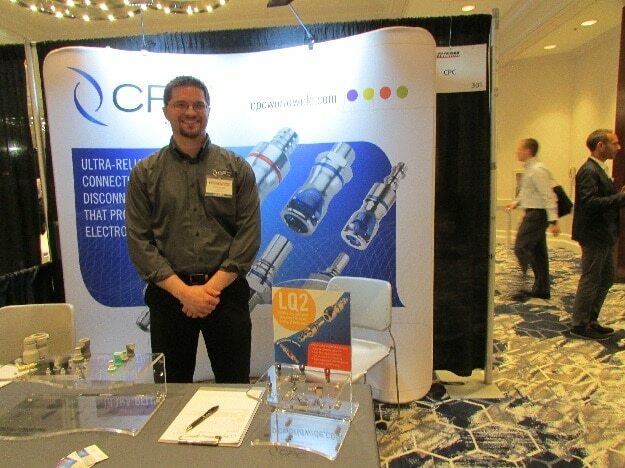 CPC showed its LQ2 Series quick disconnect couplings which it claims have the highest-flow capacity for 1/8-inch connectors in the liquid cooling industry to reduce pressure drops and help optimize liquid cooling system performance. The connectors feature unique elbow and swivel configurations and an integrated thumb latch for easy, one-handed operation in tight spaces like the server racks of large data centers. The color-coded thumb latch is simple and intuitive to operate, contributing to fast, foolproof connections. LQ2 Series also feature a multi-lobed seal for redundant protection against leakage and lasting shape retention during extended periods of connection. The non-spill design allows disconnection under pressure without leaks—a critically important factor in protecting electronics from exposure to fluid and enabling hot swapping of equipment. 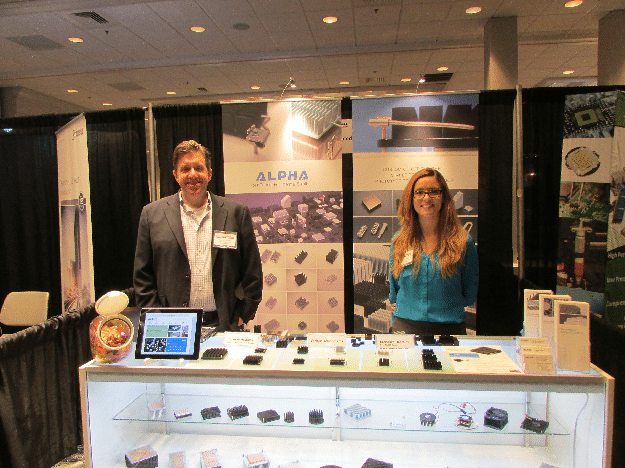 Alpha Novatech, Inc. showcased its newly added EZ Clip series of heatsinks at SEMI-THERM 33. The traditional Z-Clip has been in use for a long time, and continues to work well. However, installation typically requires slight twisting of the heat sink and/or the use of tools to engage the board anchors. If installed on a fragile device, like a bare die, extra care is required avoid potential damage. The EZ clip utilizes an additional bend section, allowing the operator to grip the clip and easily install without the need for any tools. Only the clip arm needs to move to engage the board anchors, not the heatsink. Installation and removal is much simpler and greatly reduces the chance of damage to a device. Initially, Alpha will offer 6 standard EZ clips. If necessary, Alpha can also create custom clips to meet with a customer’s board layout requirement. Existing solder/solder-less anchors can be used. 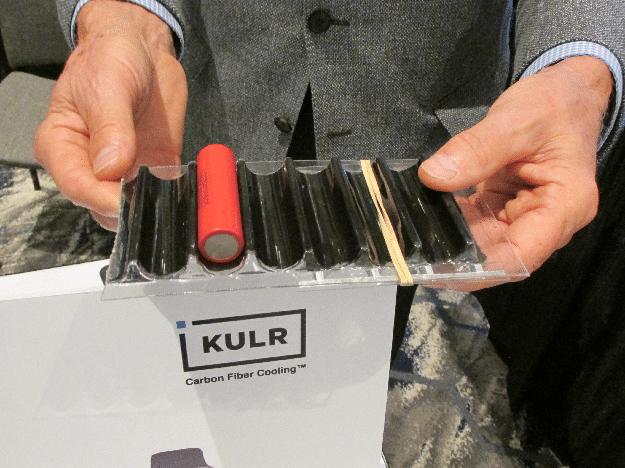 KULR Technology a leading pioneer in carbon fiber cooling technology showcased its suite of products at ST33. Its Thermal Capacitor PCM heat sink solution provides high thermal conductivity at 10 W/m-K, latent heat capacity of 150-200J/g and low density of 0.7g/cm^3. It is used to keep laser module, embedded camera module and portable devices cool during power usage peak time. Its fiber thermal interface material (FTI) requires low contact pressure of 1.0psi, fills a gap range of 0.2-5.0mm with a bulk thermal conductivity of up to 20 W/m.K. It offers a compliant and non sticky interface that can best be used to accommodate bumpy PCB boards and sliding components. Its thermal runaway shield (TRS) product is a passive cooling solution that prevents lithium-ion battery from thermal runaway propagation. It’s lightweight, cost effect and can be used with 18650 and 20700 cells. 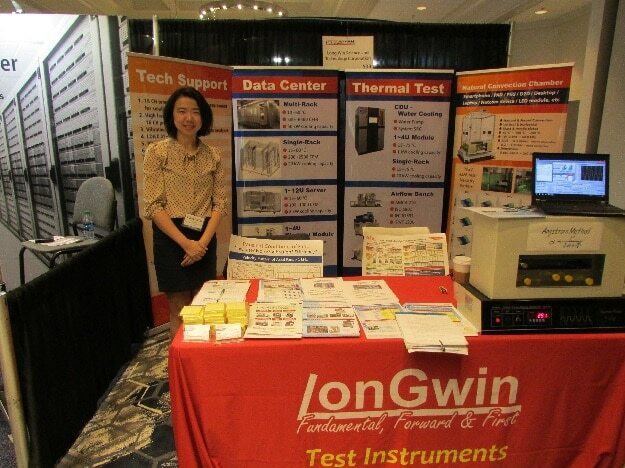 Longwin showcased photos of its series of test chambers for racks and servers, coolant distributing units (CDU) for water-cooling modules and flow benches with a flexible duct for air-cooling modules. CDUs work for either single-rack or 1-4U water-cooling modules to verify both water pump performance and system resistance; flow benches provides a validated airflow rate on 1-4U air-cooling modules mounted in the width- and height-adjustable duct to validate their thermal performance. All instruments include programmable control and automated data acquisition. Man Zai Industrial displayed the latest thermal designs at SEMI-THERM 33. We have mainly promoted advanced cooling technology – Thermal Syphon. The major benefits of a thermal syphon is that it can carry more power than a general heat pipe and vapor chamber. Therefore, we can use it to solve high-end power products such as IGBT, Telecom, IT and Cloud computing. Man Zai also offers a wide range of thermal modules for CPU, LED, and automotive electronic device while using liquid cooling system. Of course, we can create custom products to meet with any customer’s requirement. Also, our thermal team is equipped with state-of-the-art hardware and software, which includes wind tunnel testing, hydraulic testing equipment and simulation test. 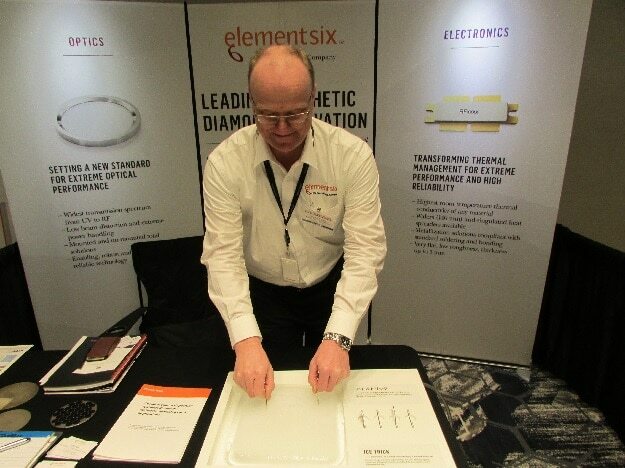 Element Six demonstrated the superior thermal conductivity of its CVD Diamond on a block of ice –two disks of same diameter and thickness with one made of Copper whereas the other a CVD Diamond disk. Technologies using CVD Diamond material include thermal management for component such as laser diodes, laser diode arrays, power devices, RF amplifiers, RF resistors, LED’s and others. Element Six also manufactures high power laser optics, beam splitters, IR spectroscopy, high energy particle detectors as well as electrochemistry and products for scientific applications. Software Cradle, now a subsidiary of MSC Software demonstrated new features of its HeatDesigner which is specially geared toward thermal management simulation of electronic products. HeatDesigner is structured (Cartesian) mesh thermal fluid analysis software specially designed for electronics cooling thermal analysis. It uses core technology from Software Cradle’s scSTREAM general purpose structured mesh thermal-fluid software product. 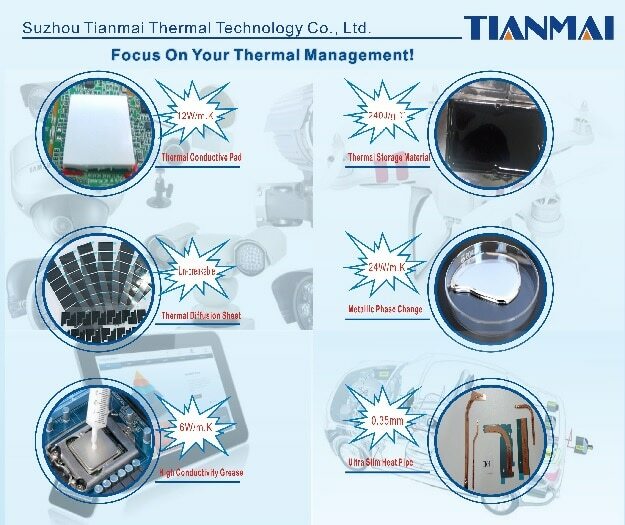 Suzhow Tianmai Thermal Technology Co., Ltd founded in 2007 founded is a developer and manufacturer of Thermal Storage/Insulate Material, Thermal Interface Material, Thermal Diffusion Material, Micro Heat Pipe module, and others type of thermal relative products. Tianmai is dedicated to provide high-efficiency, high-quality, and humanized products and services to its clients. Tianmai continues to improve and master its core technologies as its products and services continue to be qualified by millions of applications all over the world. 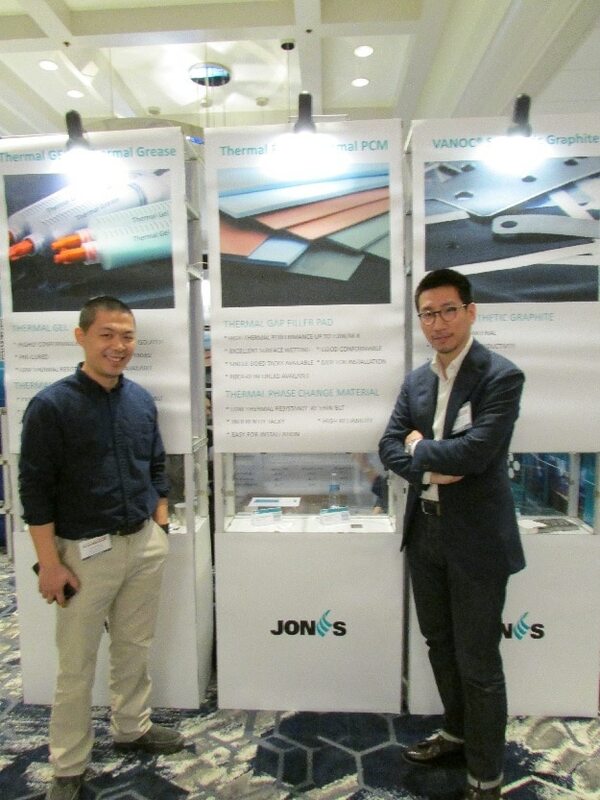 Jones Tech PLC (USA) showcased its latest thermal gap pad and heat storage material at SEMI-THERM 33. The newly added thermal gap pad from JONES Tech (USA) is capable of 15W/mk and the hardness will be remained at the same range to its 21-830 gap pad (rated at 3W/mk), which is their most popular product currently. Apparently this 15W/mk capable gap pad will be very much desired within the application becoming more compact and powerful in the telecommunication and smart devices markets. JONES Tech (USA) also showcased its heat storage material on display at the show, however the detail information regarding to its application is to be revealed on their website later this month. 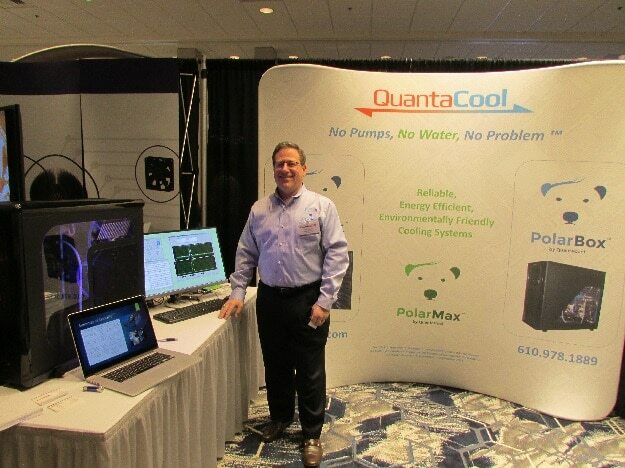 QuantaCool showcased its MHPTM passive 2-phase cooling technology, branded as PolarRakTM for data center applications, PolarBoxTM for individual computers, and PolarMaxTM for power electronics. In the photo, Dave Santoleri, QuantaCool’s president, demonstrates a PolarBox workstation with simultaneous 2-phase cooling of an over-clocked Intel Core-i7 CPU and an NVidia GeForce GPU. QuantaCool’s MHP technology provides superior, cost-effective, and quiet cooling performance. It is safer and more reliable than state-of-the-art liquid-cooled solutions, because it uses no pumps and no water. Coolant circulation is self-regulating, driven by the waste heat and gravity, requiring no external power or controls. Heat can be taken directly from processors and rejected outside the computer room. High performance computers can operate at higher speeds and with more processors without overheating. Data centers can reduce energy consumption, increase capacity, and simplify infrastructure by eliminating indirect cooling steps such chillers, air conditioning, and cooling distribution units. MHP systems are modular and scalable. The components are provided pre-filled with non-hazardous dielectric coolant, and are assembled with drip less quick-connect fittings. The cooling blocks (cold plates) can be installed without special tools. Multiple processors can be cooled via a common condenser; units can be switched-out without shutting down the rest of the system. 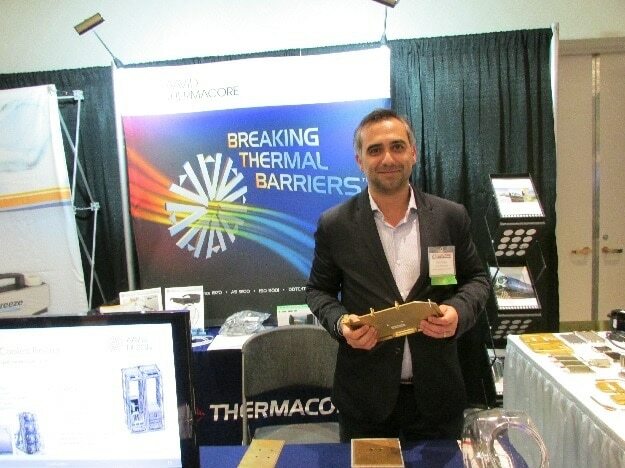 Aavid Thermacore showcased its k-Core® Annealed Pyrolytic Graphite (APG) technology at the 2017 SEMI-THERM show. k-Core® is a high-performance advanced solid conduction material system that can help alleviate heat in high power electronics for aerospace, military, and commercial applications. Using solid Annealed Pyrolytic Graphite (APG) material placed within an encapsulate, k-Core® offers effective thermal conductivity of 1000 W/m·K, which is five times greater than that of solid aluminum and three times greater than that of solid copper. k-Core® is also lightweight offering less mass than aluminum. k-Core® can be fabricated by employing most conventional thermal management metals and materials as the encapsulant such as aluminum and copper alloys, ceramics, and composites, depending on the user’s need and application. k-Core® key features include: Significantly Reduced Peak Semi-Conductor Temperatures, a higher thermal performance “ Drop-In Replacement” for Equivalent Solid Conduction, Smaller Heat Sink Size, Lower Mass than Traditional Aluminum or Copper Heat Sinks, Gravity-Independent (for 0g to >9g environments), Fully Hermetic Encapsulation, Heightened Passive Conductance: In-plane, isotropic room-temperature thermal conductivity up to 1700 W/m·K, can be CTE-matched to Semi-Conductor Materials for Direct Attachment, Rugged, and Resistant to Damage, and Aerospace Qualified. Note from the Editor: Updates from SEMI-THERM 33 exhibitors not included in this summary will be featured next week. Dr. MP Divakar is founder and CEO of Stack Design Automation, a company focused on developing ECAD-MCAD integration software platform, design stacks, services and training for next-generation electronics including MEMS, 3DIC, Printed Electronics, Wearable & Stretchable Electronics and the Internet-of-Things. He has more than 18 years of experience in electronic packaging development in microwave-, millimeter-wave and RF-communications, power electronics and MEMS at component-, module- and system-level applications. He has also worked on hardware development for semiconductor test and high speed communication fabric. 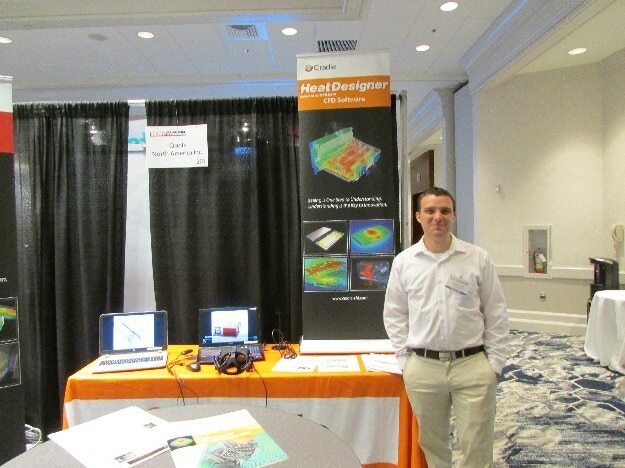 His expertise includes electronic & optoelectronic packaging (JEDEC, IPC, MIL-STD, & Telcordia), thermal and thermo-mechanical modeling, characterization and finite element simulation. 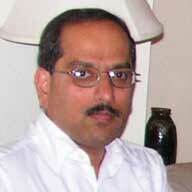 He has more than 30 publications, 10 issued patents and many applications pending. He holds PhD from Arizona State University, MSc from The University of Calgary, and B.Eng from the University of Mysore (India).